At age 38, Yves Ed’duvill Edwards has had quite a career. Born in the Bahamas and fighting out of Texas, Edwards appeared in a total of 66 professional mixed martial arts bouts, touting 42 wins—16 of those by knockout, 17 by submission and 9 by decision—and 22 losses. With most of his losses coming by way of judges’s decision, the Thugjitsu Master has been knocked out only four times in a career that spans 17 years and the most elite promotions in the mixed martial arts world: the Thugjitsu Master has fought in PRIDE, EliteXC, Strikeforce and of course, the UFC. 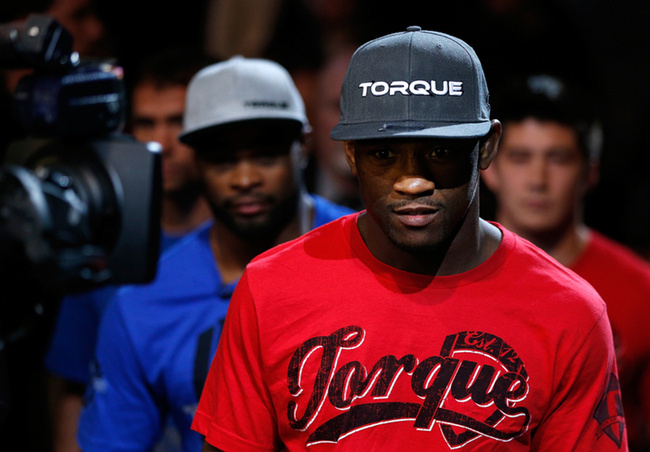 Yves Edwards’s career fell on a slump over the past three or so years, but that doesn’t take away from having once been highly-regarded as one of mixed martial arts best and most exciting lightweights. Can’t forget that at UFC 49 In 2004, he knocked Josh Thomson out with a terrific flying head kick followed by a flurry of punches, in 2012 he took out Jeremy Stephens. 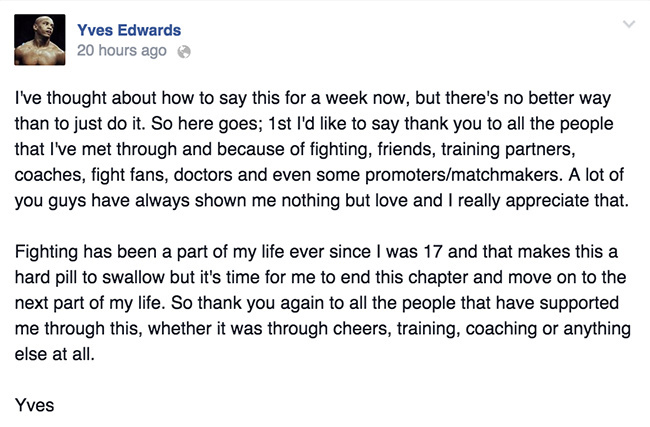 But ever since that Jeremy Stephens fight, Edwards has had a hard time making magic happen. His last five fights are comprised of four losses and a no-contest—which came when Yancy Medeiros’ win over Edwards was overturned due to found Marijuana usage—a record that unfortunately wouldn’t hold up to the ebb-and-flow of the lightweight division for very long, keeping in mind that it is populated by Gilbert Melendez, Anthony Pettis, Rafael dos Anjos, Edson Barboza, Nate Diaz and Khabib Nurmagomedov. His last loss came at the hands of Akbarh Arreola, one of Mexico's most promising talents, in an armbar submission. With that in mind, we salute Yves “The Thugjitsu Master” Edwards, who will hang up his gloves to the praise of adoring fans and to the endless respect of his peers in the sport.